Most people think I'm crazy when I tell them I have 4 dogs. Even though they are little Chihuahuas, they can still make a big mess and one thing I try to be very diligent about is the smell of my home. When guests are over I don't want them to walk in and know that it's a home full of 4 dogs. One of the things that really helps is vacuuming on a weekly basis so there isn't too much fur or dander anywhere. I make sure to do it on the same day every week that way I never get too far behind. Another thing I do is wash the dog's bedding and plush toys every month. I should probably do it more often but for now once a month works. And if you don't understand why I would do that... go take a whiff of your dogs favorite stuffed animal and favorite blanket. See, I told you! One other big thing I do is burn candles to make my house smell better. That's where the One Fur All Pet House Candle comes into play. This candle is safe, decorative, and smells wonderful. It actually comes in Lavender, Citrus, or my favorite - Pumpkin Spice. These candles are made in the USA and infused with essential oils. They are hand poured with 100% natural soy wax into a reusable jar. It's a great odor neutralizer and one of these candles can burn for approximately 70 hours! The jar is so pretty and looks great as a piece of home decor. I love One Fur All because they are also advocates for rescue and adoption and they've donated countless hours to help care for rescued animals and promote their adoption. Plus they created a Rescue Fundraiser Program to help non-profit, no-kill rescues to raise funds that pay for vaccines, medicine, and surgeries. 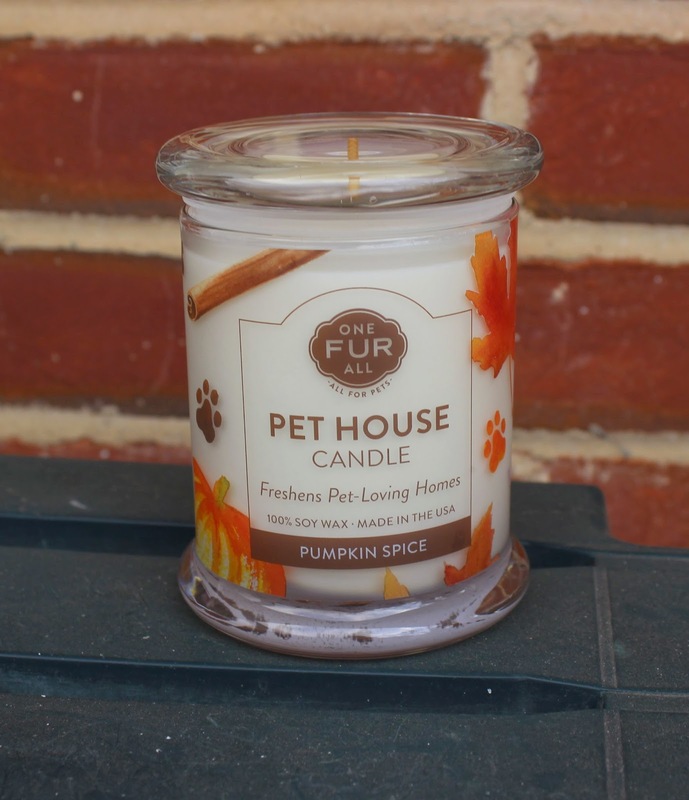 So next time you think of how to make your pet-filled home smell better, consider purchasing a One Fur All Pet House Candle so you can help support a company that does A LOT of good! What are your tips for a fresh home with pets? Carpet freshener is one thing I used to use ever other week.